Mouse embryonic stem cells (mESCs) are pluripotent cells derived from preimplantation embryos that have the capacity to self-renew indefinitely in vitro. mESCs are an indispensable tool for studying cellular differentiation in vitro, generating disease in a dish models, and have been used extensively for the generation of transgenic animals. Therefore, maintaining their pluripotent state, even after extended culture, is crucial for their utility. Herein, we describe in detail a protocol for the culture of mESCs in the presence of fetal calf serum (FCS), leukemia inhibitory factor (LIF), and a layer of irradiated mouse embryonic fibroblasts (iMEFs). 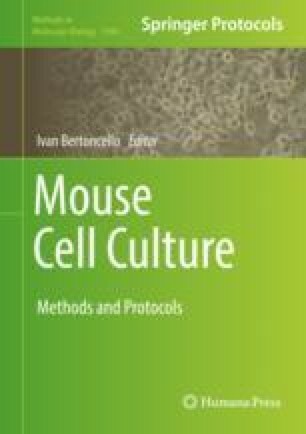 This culture system reliably sustains mESC pluripotency and self-renewal capacity, allowing their use in a wide range of experimental settings. Jacob M. Paynter and Joseph Chen contributed equally to this work.